Organizers of the TEDx Syracuse University conference have announced the final speaker lineup for their 2016 “Glitch” Conference. The student team has selected eight speakers under the “Glitch” theme, with presentations surrounding topics such as courage and selflessness; the true power of humor; the deterioration of stigmas; and many others in between. From local community leaders to photographers, personal trainers to psychotherapists, filmmakers to trauma survivors, this year’s speakers will be able to connect with a variety of passions, interests and experiences throughout the Syracuse community. Speaking at “Glitch” will be Amy Oestreicher, Matthew Schrier, Emily Anhalt, Mark Horvath, Nick Murphy, Sean Kirst, Siddhi Sundar and Brian Kam. The event will take place April 16 in Slocum Auditorium. Ticket information will be made available in mid-March. 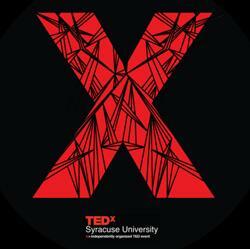 In the spirit of ideas worth spreading, TEDxSyracuseUniversity is a local, self-organized event that brings people together to share a TED-like experience. TED stands for Technology, Entertainment, Design—three broad subject areas that are collectively shaping our world. A TED conference provides a broader experience, showcasing important ideas from any discipline, and exploring how they all connect, in a fast-paced format.